This page is based on explanation, which I have obtained from Daniel Prokopec. Together with that description you can have a look at a page Interfacing the PC's Keyboard too. The communication is running through two wires. In fact it is serial synchronous communication, where the wire called DATA (pin 2) serves for data transfer and the wire CLOCK (pin 1) provides clock signal. The power supply voltage 5V is on pin number 5, ground GND is on pin 4 and RESET signal is on pin 3. 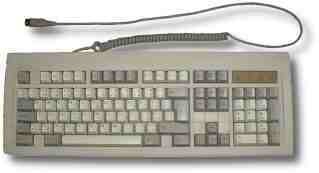 The RESET signal is used due to compatibility with an old type of XT keyboard. The frequency of CLOCK signal can vary from 10kHz to 20kHz. After pressing a key the keyboard sends a key code to the PC. After releasing a release-code is sent out followed by the key code of released key. The CLOCK signal is always distributed by keyboard (in both directions of transfer) and the code diagram is shown above. Valid data must be present at the time of falling (H \ L) edge of CLOCK signal. The DATA signal is controlled by keyboard when the keyboard is talking and by computer when the computer is talking. The communication code consists of one start bit, eight bit word, one parity bit (odd parity) and one stop bit. In case of communication from computer to keyboard the computer starts with setting the DATA wire to state L and the keyboard will answer with the clock pulses on the CLOCK wire. The computer follows clock signal and sends all start, data, parity and stop bits like during communication from the keyboard to the computer.